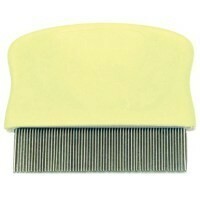 Flea Comb for cats and dogs, a seriously useful grooming product, ergonomically designed, catering for all pet owners. Regular grooming increases pet and owner interaction as well as keeping pets looking and feeling good. A few brushes through the coat will show you any fleas and flea dirt. To distinguish between grit and flea dirt place the black specs on a damp tissue for a few seconds and then rub them. If it is flea dirt you`ll see the blood stain on the tissue.